Good morning loves!! Who's so happy it's a shortened week and that Thanksgiving is just a few days away?? Me! Me! We're getting somewhat lucky this year because we aren't hosting Thanksgiving OR Christmas, so the pressure is off. Meaning, I've got more time (and energy) to work on my annual Holiday Wish Lists for you guys. Okay, well they're really for me, ha! My family members depend on these wish lists for guidance on what to get me, so I need to come through with making these. And if not hosting any major holiday dinner leaves me with more peace of mind and time to work on these, then I am all for it. And it's never really a difficult thing to do when it's all things I wouldn't mind at all finding under the Christmas tree, right? 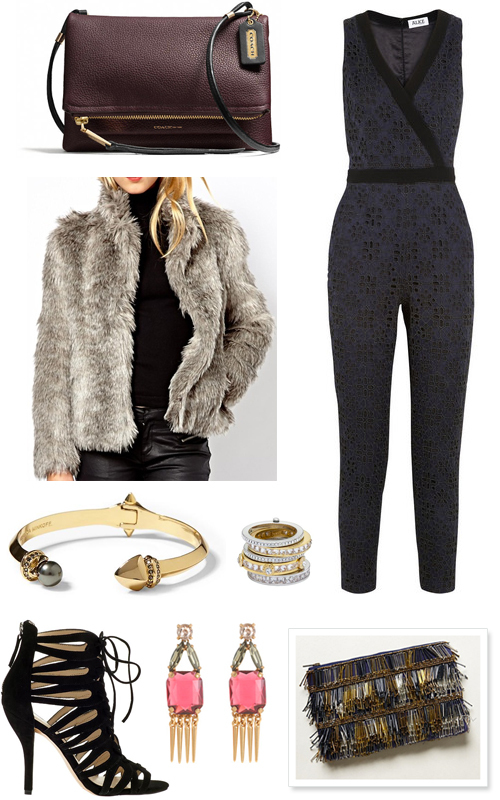 I didn't mean to create an outfit wish list, but it does seem that I've managed to do that. But every single item is something that I would love to get as a Christmas gift. That ALICE by Temperley jumpsuit might be a tad pricey, but it's my kind of jumpsuit. The embroidered black organza is a dream and it's such a great alternative to an LBD. And seeing it as an LBD does make it worthy as an investment piece that you could wear over and over again, no? And I'm in need of a new faux fur jacket. I love the one I purchased from Zara a few years ago, but I'm thinking I need one that's lighter in color. As if I need any more crossbody bags, but this Coach Urbane one might just be the end-all-be-all. Do you have any favorites in the bunch? What are you hoping to get this year? this jumpsuit is to die for. i haven't come across it yet but i think i may need to wear this to a holiday party. thanks for the great ideas. That faux fur coat looks sooooo comfy and cozy!!! Love it! I want those stacked rings in a really bad way!! !